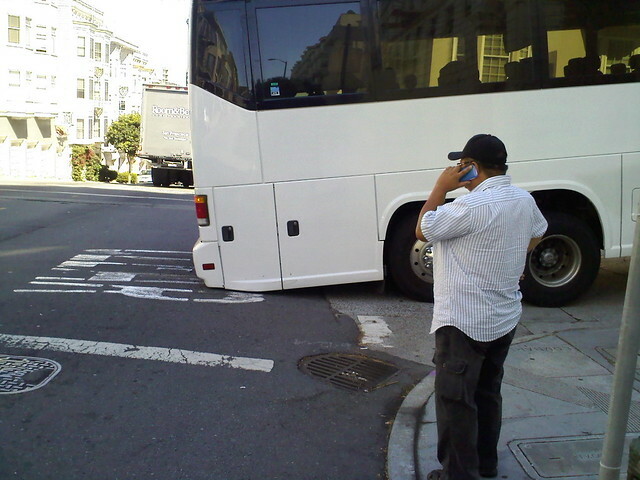 This is what happens when you're a bus driver who doesn't take into account that you're driving in a city built on actual, steep hills, where you need to actually build up inertia to move your hulking touristy behemoths. Braking while going uphill, losing all your inertia, and then backing up and crushing your tailpipe, muffler, and all the soft, chewy bits on the underside of your motorized carriage is not advisable. Going backward is not an option. And going forward isn't much of an option either, apparently. "So... do you have a truck big enough to tow an extra-long bus? Uphill? At a 50% grade? Maybe your tow truck and my bus could make a nice sandwich together?!"